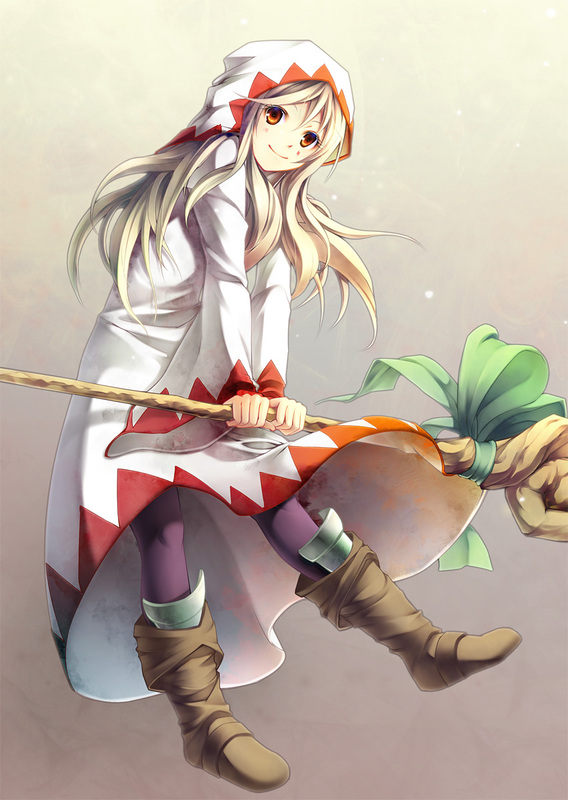 Personality: Alma is an enthusiastic student in the art of white magic, and a firm believer in the power of nature. Though she sees little wrong in the magical manipulation of natural forces, she frequently expresses an extreme dislike of modern devices, especially physical machinery. Claustrophobia also seems to be an issue, though not consistently. A closet may prove problematic, but a greenhouse of the same size would not, further showing her affinity for nature. Windows tend to calm her as well. Though she's not quite a pacifist, she does hold an aversion to real combat, and prefers ranged and control magics to disable and distance her opponents. History: Though not native to the World, Alma was raised in Wonderland, where she first discovered her unusual talent in the caretaking of plants. When questioned, she wasn't able to explain her skills, and eventually it was chalked up to an affinity for white-magical energies. She was nearly always cheerful, so the conclusion stood that these feelings unintentionally passed onto plants nearby, motivating them to grow well. This was rather taxing on their water bill, of course, and at one point they moved to an area near a river so they would draw from it instead. The family made a steady living selling the crops they were able to grow, and though they weren't excessively rich, they were far from any debt. Life was, for the most part, uneventful, and as years passed the family began to dissipate for one reason or another. Her father, Koloman, and her brother, Till, had both left, and she was left with her mother. She began to read in her free time, since the loss of fifty percent of their members meant they had an excess of crops and little cooking to do. She gathered many books, fmost fictional, and took an unhealthy liking to tragedies. When she found one particular book, she began to worry. It depicted a daughter and mother, both living far from civilized life. When the mother went under with an illness, the daughter left to find a cure. After many troubles, each greater than the last, she found what was needed, and brought it back only to find that the mother had passed shortly after her leaving. Alma became paranoid, worrying that her aging mother would contract some sort of illness as well (Though she was still quite young, actually, barely having passed thirty years of age). She refused to allow such a story to ring true with her own life, and so when she heard that an academy had opened its doors in another World that could teach the use of magic, Alma announced that she'd be enrolling. She left, and sometime later she obtained a uniform as proof of membership. Other Notes: Alma's abilities will be mostly based off the recurring Job class, "White Mage" from the Final Fantasy series.